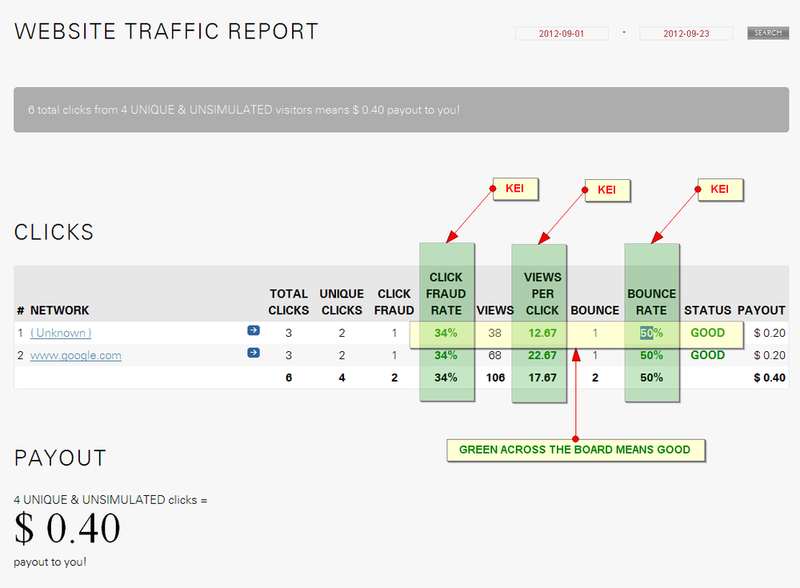 Your Clicks/Traffic Report Learn how to read, and understand your clicks report. We make it dead-easy to spot low quality and performance issues that costs you earnings and payout. Step by step information for getting the most out of your Affiliate partnership with AJIBOYE. Log into your account and access your Clicks/Traffic Report to monitor the quality of the traffic you are sending us with your marketing efforts. A copy of your report is also automatically emailed to you once, every week. Your report is structured to make it easy to understand how your payout/commission is calculated based on the quality of the traffic you are sending us. You will see a row for each network ( or web property ) on which you are marketing. You can click on each network to drill down into specific origin pages, and other details. Click fraud rate - example, your website sends us 100 clicks, by 90 unique people, means some folks click through more than once, and your click fraud rate is 10/100 or 10%. A high click fraud rate could indicate POOR traffic of one form or the other. Views per click - example, your website sends us 100 clicks, that went through 300 pages, means an average of 3 pages per click. A high views per click is a strong indication of a well put together marketing campaign. Bounce rate - example, your website sends us 100 clicks, by 100 people, with 30 of which immediately leave without looking at any other page/information, means a bounce rate of 30/100 or 30%. A high bounce rate is a strong indication of both a poorly put together marketing campaign and/or POOR traffic of one form or the other. We have chosen to not disclose the remaining metrics at this time to unscrupulous parties from engineering a solution that will evade our automated monitoring/reporting systems. Your KEI values are color coded in red ( BAD ) and green ( GOOD ) on your report. You want all your KEI to be green to have a GOOD quality status for your traffic from any network. If any of your KEI is red, your quality status for that traffic will be marked as POOR. Improving the quality of your marketing messaging, linking to the right product/service pages, and avoiding unethical shortcuts designed generate clicks rather than market products/services. Start by reviewing our marketing basics. Follow up by reviewing appropriate guides on online marketing, offline marketing and email marketing.